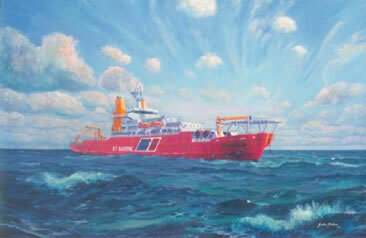 One of three paintings commissioned by BT Marine while this revolutionary ship was being built. BT requested that the ship is shown repairing cable mid Atlantic in a force four to five, beam on to the sea. This being the roughest conditions she can hover on station with an accuracy of one metre.